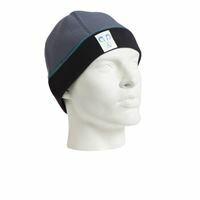 Merino lined neoprene beanie, which provides a comfortable and warm fit for long cold days on the water. The merino lining means that it will stay warm even when wet. The reason for this development is that it comes from a sustainable resource whereas synthetic linings are constructed from petrochemicals. In addition, Merino is as natural and organic as your own skin. Being in the cold has never been this warm due to revolutionary, comfortable, antibacterial and odor resistant wool in your gear. In tests conducted by the British Textile Technology group, Merino lining proved to offer a 35% increase in thermal efficiency, in both dry and saturated conditions over the best, comparable synthetic linings. Warm soft Merino wool lining for added comfort.